Inscription: Inscribed in the upper left, in black ink, "ALLA IMORTALITA FIDIA PRASITALI CANOVA" by the artist; inscribed in the lower right, in black ink, "VEN ... MARCO" by the artist; inscribed along the lower edge, in black ink, "Il tempo scopre la Verita, a Minerva, nel tempio della imortalia" by the artist. Secondary Inscription: At lower left, inscribed "Giani" in brown ink. Under a high, coffered dome, numerous mythological figures prepare a monument in honor of the famous Italian sculptor Antonio Canova. Minerva, the goddess of Wisdom, leads Canova toward the cylindrical structure, while the winged figure of Fame, holding a trumpet, tries to crown him with a laurel wreath. In the center, Victory inscribes Canova's name on the monument for two of the most renowned sculptors of Greek antiquity, Phidias and Praxiteles. At the base of the monument, Time unveils Canova's sculpture Theseus and the Minotaur, while the figure of Truth leans against it with the light of knowledge on her breast. At the far right, Evil is overcome by the lion, the attribute of Saint Mark and the symbol of Venice, where Canova lived. 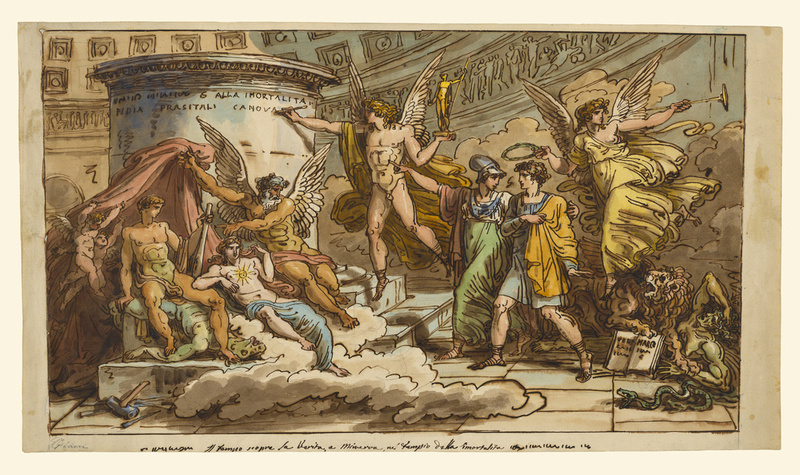 Felice Giani produced the drawing as a preparatory study for a monument, planned but never built, in honor of Canova. The sculpture was to commemorate the artist, who died in 1822.